In compliance with polluting liquids storage regulation (May 2nd 1998, article 10). .
For corrosive, toxic, noxious, pollutant and flammable storage. 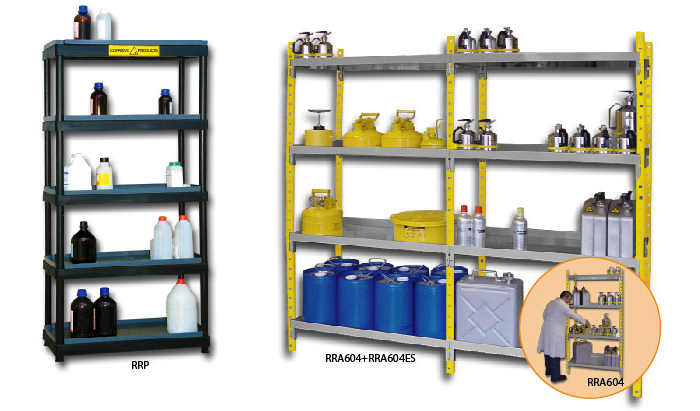 Allows to store products by categories and chemical families. Retention tanks with edges prevent the cans from falling. Easy sight of stored products. Acceptable load per level: 70 kg. High density polyethylene (HDPE) base support. Large warning labels in compliance with ISO 3864, 92/58/CEE, European directive and NF X08.003 norm standards. - Easy removal for cleaning. 4 levels of storage adjustable in height (step every 6,25cm). Acceptable load per level: 250 kg. Sturdy steel construction with yellow epoxy paint RAL 1004 finish. - Grey epoxy paint RAL 7035. - Height : 50 mm. - Available in 2 depths: 400mm or 600mm. Industrial absorbing mat (Ref. : JF10D).